Eric Berry was born December 29, 1988 in Fairburn, Georgia,nicknamed The Fifth Dimension isan American football defensive back formally playing for the TennesseeVolunteers. 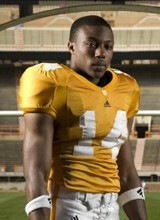 A true freshman for the 2007 Tennessee Volunteers footballteam, Berry made his first appearance at nickelback against California beforebeing named as the starting strong safety in the following game againstSouthern Miss. He would remain at that position for the rest of his collegecareer. Berry was only flagged once during his time at Tennesee. Berry left college leading all NCAA players in totalinterceptions, interceptions per game, interception return yards, and interceptionsreturned for touchdowns. Statistically, Berry was considered one of the mostdominant defensive backs in NCAA history, often being compared to Ed Reed. Football stars such as a Eric Berry have taken the game to new heights by excelling at their respective position. The booking agents at AthletePromotions can assist with Eric Berry speaking engagements or appearances from NFL stars. We have years of experience in booking gridiron greats for keynote speeches and autograph signings. Hiring a football speaker like Eric Berry is not a hard process. Our agents can provide availability, fees and all costs associated in bringing out a successful football star to your next corporate event. We can find Eric Berrys agent to make this booking happen. A Eric Berry appearance will add energy to your upcoming event and reward employees, customers and clients.Most likely, football fans and corporations can find Eric Berry's official website, charity involvement, Twitter account, representation, publicist and management info at www.Eric Berry.com.